Visit our new Online Shop and buy our services easily by paying with your credit card. Santa Teresita is a resort, hotel, and a Hot Springs Spa in Guatemala. We have Thermal Pools with slides, Steambaths combined with hidrotheraphy, a Spa, and a Thermal circuit with pools at temperatures. In Santa Teresita Spa you will find relaxing massages and body treatments. We also have two Restaurants serving national and international food and two outdoor food stations. 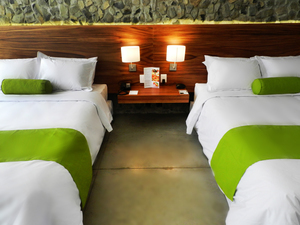 If you wish to stay we have an authentic hot springs Hotel with LEED-NC Gold certification. We hope you can visit us!. We are waiting for you. We have a new Jacuzzi for Thermal Circuit customers! We inaugurated a new jacuzzi located in the area of ​​the castle in front of the massage pergolas. This service is included in the price of the Thermal Circuit and is ideal to Relax after your therapy and continue enjoying the benefits of thermal waters. Check it out! Live an authentic experience of Relax in Kawilal Hotel.